We’ve been sharing monthly data insights with you for some time, but we wanted to dig a little deeper with our new Demand Quarterly. The Storyblocks Analytics team wants to share its insights into what is trending in search, what our customers are asking for, and what is popular in visual design. With this demand analysis in your toolbox, you are better positioned to get the right content in front of buyers. What are buyers searching for and what content is in demand? We dove into search data and looked through thousands of search terms on Storyblocks over time. By looking at content that has experienced an increase in impressions, we’ve identified some emerging themes. The top trending theme we’re seeing is storytelling elements. 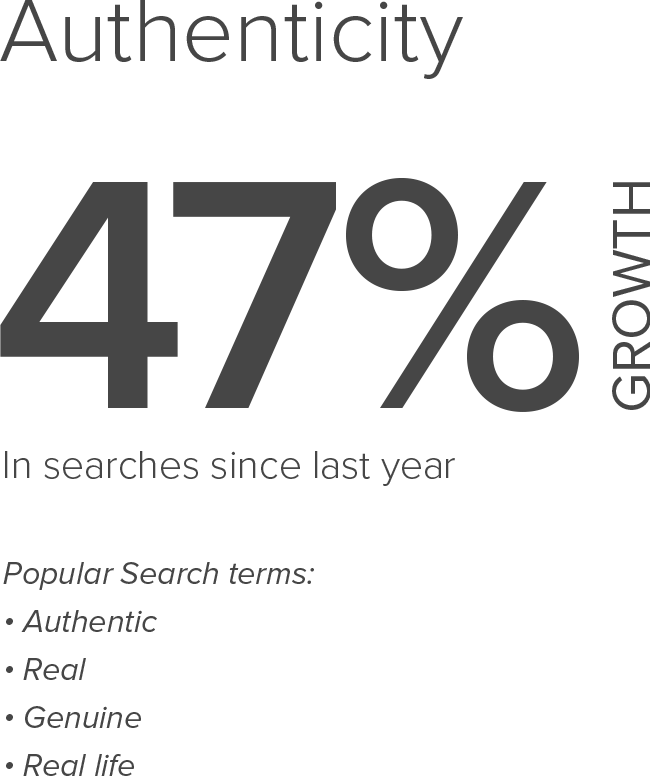 Content related to search terms like cinematic, typography, transition, background, and promo, have seen large increases in impressions—indicating that buyers are looking for and purchasing assets to strengthen and polish their stories. Similarly, content that depicts media being created by artists is also trending. We’ve identified an increase in searches related to the natural landscapes and the outdoors. Demand for people in wild environments, the exploration of the natural world, recreation, and solo travelers seeking solace is also increasing. Tech continues to advance and has become a more present force in our everyday lives as well as in content searches. People working with technology has also skyrocketed in search as customers are searching for imagery to express how we interact with technology, AI, and robotics in our daily lives. The opposing concepts of technology and nature in imagery are both battling it out at the top of our trending list. It’s interesting to see both nature and technology trending—this points to evidence that as we become more dependent on technology and automation there is also an increased desire for returning to more natural environments. In a data-driven culture that’s obsessed with visual representation, it’s no surprise that presenting large swaths of information in a compelling visual format is on-trend. Right alongside the increase in searches for infographics, we also found an increase in the number of searches for basic shapes, patterns, and graphic elements. Customers are searching for graphic elements to help them visualize information in an easily consumable manner. We’re seeing a visual trend in flat infographics where color, negative space and heavy contour lines aid in defining data blocks. What’s In? | What’s Out? Homes and the Domestic Sphere – People interacting in their homes, moving and packing, cooking, and doing day-to-day domestic activities. Community and Neighborhood – Communities, organizations, and visual imagery that represent people interacting with those close to them. Spirituality – Visual imagery representing spirituality, community, togetherness, faith, and otherworldliness. Content saturation means that customers are finding what they need when they search and there may be an oversupply in that theme. These themes are still popular and while we encourage you to upload fresh content, we want you to keep in mind that there’s more competing content, so your content may not be surfaced as much in these topic areas. If you are shooting new content, find a fresh perspective or push the composition to cinematic proportions. Customers are looking for authentic representations of these popular topics, so keep that in mind when shooting new content. Cities and Countries – City landscapes perform well, but we seem to be meeting the needs of customers searching for Shanghai, Hong Kong, Seattle, New York, Dubai, and other major cities. Prison and Jail – Demands for content depicting incarceration and criminal justice are being met in search. Mental Health and Depression – Imagery that is evocative, emotional, and authentic performs the best. Try to shoot content that is conceptual, current, and not over-dramatized. Subject matter is not the only thing to consider. There are some themes that apply, no matter what your subject. We’re still seeing an incredible and growing demand for diverse and authentic content. Creating content that is on-trend is one way to bring buyers’ eyes to your content, but it is equally important to accurately tag it. The number one thing we hear from our Analytics and SEO teams is that relevant titles and keywords are the most effective way to surface your content and continue to get high placements in search. Use a few relevant and specific keywords rather than overdoing it with a large number of broad keywords. Make sure titles are relevant to the keywords you use. Overstuffing keywords in your metadata does not have a positive impact on surfacing and it can actually hurt you in the long-run. We recommend you double check the spelling of your titles and make sure that they read like sentences that describe your image or video. We hope this is helpful! Each quarter we will bring you the most current analysis of content demand. Do you have suggestions for what you’d like to see? Shoot us a note. We love to hear from you!